What is the most important part of any off-planet exploration vehicle? A nice dash of flair in the form of a raccoon tail dangling from the tailgate. 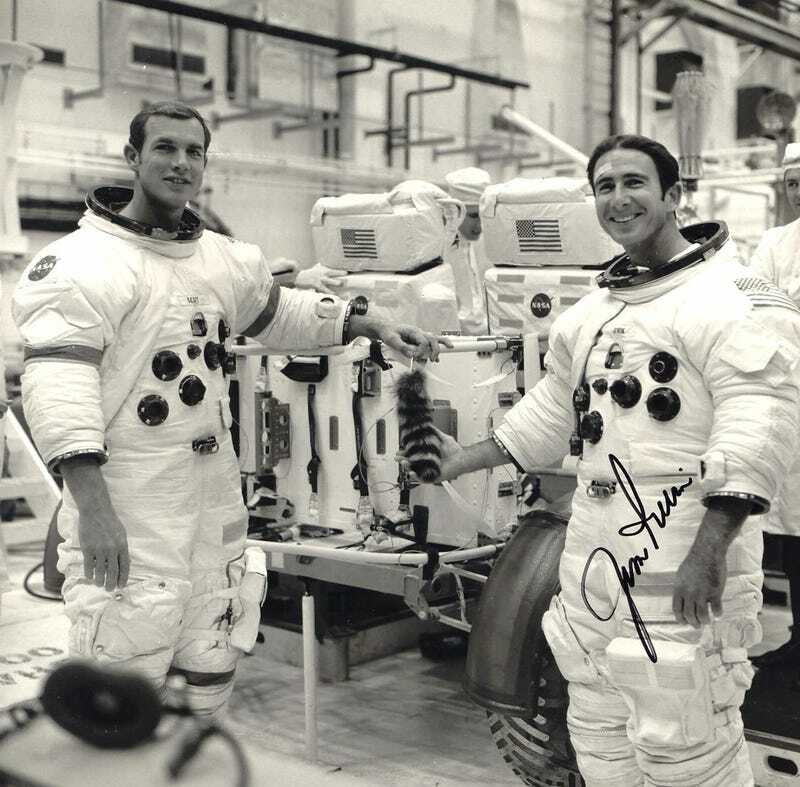 The Apollo 15 astronauts Jim Irwin and Dave Scott were the first off-planet drivers, taking a lunar rover for a spin around Hadley Rille in 1971. But before they left Earth, they needed to properly accessorize their moon buggy. With all the drama of mischievous schoolboys, Irwin helped Scott pull a bag out of his leg pocket, fluffing it up after extraction. With a pair of scissors, they cut open the first bag, revealing a second bag and drawing out the anticipation. They peeled open the second bag, with Scott reaching in to finally expose the raccoon tail dangling from his grasp. The room immediately burst into clapping, cheering, and laughter as Irwin and Scott ceremoniously taped the tail to the right rear fender. Lunar Rover Vehicle properly accessorized, the two astronauts clambered in and declared, “Let’s go get this baby!” to kick off a highly-successful test session. After the test was completed, prank-originator Reyes convinced the photographer to snap a photo of Scott and Irwin posing with their prized tail. Irwin’s forehead was bandaged after an over-eager and nervous suit technician forced the helmet onto his head earlier in the day, scraping his forehead.